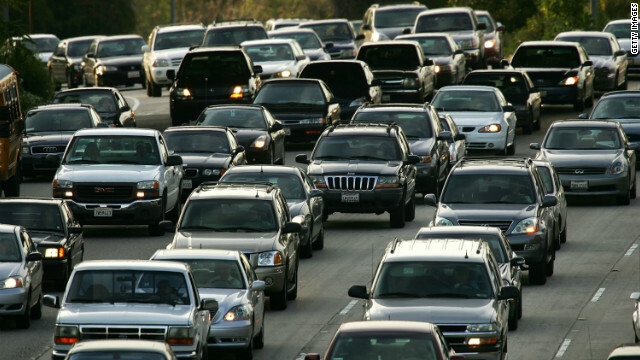 Imagine if you will, five cars on the 405 (or your local freeway, if you live outside of LA) occupying every lane except for one, driving side-by-side talking to each other on their cell phones while taking sips of big gulps and driving 20 miles below the current speed of traffic… at rush hour. Open spaces ahead of them, an utter quagmire behind. The cars putter along, ignoring the horns of the drivers who manage to squeeze around their mobile traffic jam. This would be a “Sig Alert” (or “Traffic Cluster-F%$#@,” again if you live outside of LA) of epic proportions and probably result in a few warranted road rage mercy killings. It wouldn’t be so bad if these walkers simply started at the very back of the pack and let the faster runners go out first to run their race. But for some reason this traveling logjam decides that they should be in the fastest corral. I don’t know if it’s because they don’t have any grasp of their actual pace or figure that by starting sooner, they’ll finish sooner… everyone else be damned. As one of my fellow runners wisely pointed out, Disney races are extremely susceptible to this malady. Let me share with you one of my own experiences to give some corroboration to my complaining. 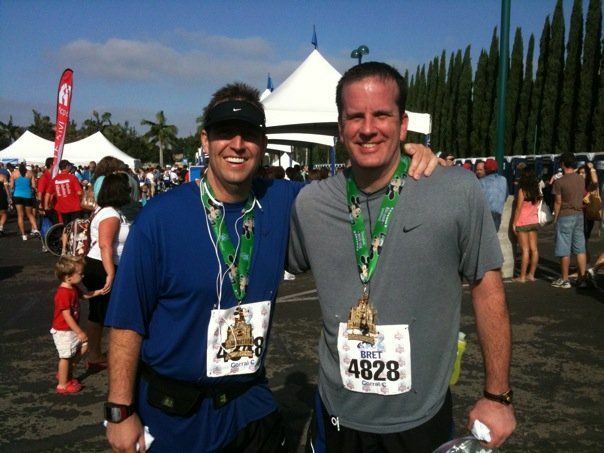 At the 2009 Disneyland Half Marathon, I was a relatively new runner, doing only his 3rd long race. That said I was hoping to break the 2:20 mark for the first time and PR. But running this race was like weaving through a minefield. I spent a ridiculous amount of time and energy dodging the walking walls. I felt like Luigi in a 13.1 mile live-action version of Super Mario Bros. As I approached the final half-mile, I glanced down at my Garmin and noticed two things. First, that I if I sped up, I had a chance of breaking 2:20. Secondly, by being polite and weaving, I had added over .4 miles to the race, slowing my time immensely. For those of you who have run Disneyland, you know that the final straightaway to the finish line is narrow and a bit of a bottleneck. So, I sped up, still dodging the walkers and racers who seemed to have run out of gas, yet didn’t move to the right. I made a turn and there was the finish line just ahead. A quick glance at my Garmin showed I had about 20 seconds to finish if I wanted to make my goal. I leaned forward and motored. Then I saw it. Five runners (no, walkers) had locked arms and spread out in order to cross the finish line simultaneously. I thought “You have got to be F&$#ing kidding me” (I didn’t say it because I was at Disneyland after all). They were taking up the entire course. I realized there was no going around them and if I slowed to match their pace, I wouldn’t make my goal. So, I went right the hell through them. I found the weakest link in their arm chain and plowed into it like a (insert your favorite football team here) running back heading for the endzone. My final time… 2:19:55. Touchdown! Post Disney, celebrating my goal line run with a buddy. No sooner had I received my medal than one of the group came up to me to voice his displeasure at my “utterly dastardly” (his words) act. Here’s my reply. Okay, what I actually said wasn’t nearly as eloquent or free from profanity, but you get the point. I lifted my water bottle, gave him a salute and walked away smiling. So, what is the point of this rant? If you have any friends who are planning to walk a race (especially new runners), please share with them these etiquette nuggets. Line up in a corral that realistically reflects your pace. When in doubt, go in the slower corral. Please don’t walk more than 2 or 3 abreast. Slower racers should move to the right of the course. The left side is for faster runners and those passing. Please be aware of your fellow runners, especially those behind you. Don’t get between Scott and the finish line when he’s chasing a PR. Oh, I almost forgot to share that tip I promised as your reward for listening to me rant. It’s a surefire way to temporarily disperse the walking wall so you can get by. You see another annoying characteristic of the walking wall is they have selective hearing. If you approach and say, “Excuse me” or “Can I get through,” it typically falls on deaf ears. When you get within about three steps of the inconsiderate group, act like you’re hocking up a lugie (I’m talking a “mas grande” one). I guarantee you that group will part like the Red Sea. Sure it’s a bit childish… but so is selfishly blocking the course. Posted on January 12, 2014, in Etiquette, General, Humor and tagged Disneyland Half Marathon, Etiquette, PR, Rude behavior, Walking Wall. Bookmark the permalink. 1 Comment.